Advantages: Superb artwork, excellent selection of photographs, 1/48 and 1/72 scale drawings and interesting text. George Haddow is no stranger to Austro-Hungarian flying boats. It comes as no surprise then that he authored the latest Datafile to come out of Albatros Productions. The KuK Kriegsmarine made extensive use of flying boats in World War I. 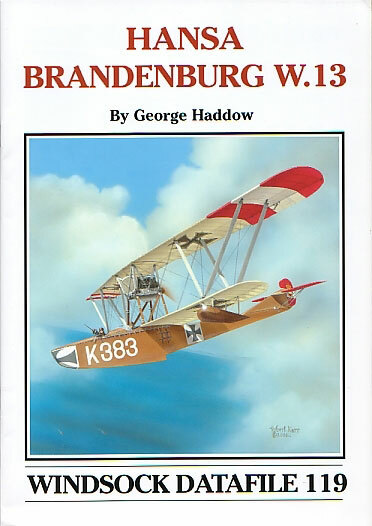 One of the larger types was the Hansa-Brandenburg W.13 which was a product of Ernst Heinkel’s design team at Briest. A number of different contractors were involved in producing this aesthetically pleasing aircraft and the type gave a good account of itself in service. The author relates the story of this plane in a pleasant, easy to read manner. The narrative is informative and is complimented by the captions to the photographs. Speaking of the latter, there are sixty black and white images, most of which will be new to the reader. As well as the conventional full airframe images, there are plenty of detail shots also included. These show specific facets of the engine, cockpit, floats and internal structures. The writer also supplies his own scale drawings and these are found in both 1/72 and 1/48 scales. With multiple contractors involved, it is essential that the detail differences are noted where necessary. This has been done. Naturally there is a section on colour schemes and Ronny Bar contributes with three lovely profiles. All wear a significantly different plumage so the modeller has plenty to choose from when replicating this aircraft in miniature. Robert Karr’s stunning piece of cover art adds yet another alternative to build and rounds out a worthy addition to the Datafile family.